So goes the spin that Frankie tries to put on Feb. 14th gift-giving at the beginning of The Middle’s fourth annual Valentine’s Day episode, and although she’s got a history of occasionally offering up sentimental platitudes in an effort to excuse her own failures in judgment, this is one that holds up relatively well under closer scrutiny. As a rule, if you go with a straight-from-the-heart, it’s-not-about-the-money-it’s-about-the-love gesture done for the right reasons, i.e. not simply because it’s cheap and you’re lazy, then it will be appreciated. There’s just one catch: you’d damned well better know your audience, or you’re screwed… and not in the good Valentine’s Day way. If you hadn’t been watching Brick for the past four seasons, then you might be skeptical of his claim that his year’s Valentine’s Day card for Frankie was some of his best work, but given the kid’s attention span, that somewhat ramshackle endeavor was probably pretty close to as good as it gets, which is why it’s so easy for him to latch on when his mom cheerily agrees, “And I think you’d be right!” Her claims that she’s going to cherish it forever are a little premature, however, as her face drops—along with one of the candy hearts glued to the back of the card—the moment he walks away. When Brick accidentally stumbles onto Frankie’s dirty little secret—she’s been tossing out his stuff for years—he’s understandably distraught, to the point of trying to make her feel as rotten as possibly by asking to see some of the material she claims to have saved, explaining, “The years have gone by so fast. I’d like to reminisce.” In an act of desperation, she runs over to Nancy and begs to borrow one of her kids’ art projects in the hopes of faking Brick out, but given Mike’s instant reaction (“There’s no way in hell Brick made that”), it’s clear it’s never gonna work. Throwing herself on the mercy of the court, Frankie admits her sins to Brick and tries to underline how she’ll never forget the feeling of getting those things in the first place, but if she’s looking for forgiveness, she’s come to the wrong place. On the other hand, I’m betting she probably walked away wishing she’d saved that damned ceramic sponge caddy, at the very least. (“It said, ‘I hate housework.’ I’m sorry, do you like housework? Because I think that would be something you would keep!”) Frankie does finally manage to earn back the love of her youngest son, or at least to return to their previously established equilibrium, but let’s hold off on discussing that for a bit and instead venture into Mike’s storyline. When Sue asks Mike what his Valentine’s Day plans are for Frankie, he initially shrugs off even the smallest of her suggestions for possible romantic gestures, explaining, “We’re not those kind of people,” and convincing himself that she’ll be suitably impressed by the fact that he’s taking the Christmas tree out to the curb without actually having been asked to do it. (Not that conscientious viewers didn’t notice the tree still loitering in the living room a few weeks back, but the fact that it’s a month and a half after Christmas and Mike hasn’t been asked to take it to the curb says a great deal about Frankie’s general lack of concern about cleanliness.) After performing this heroic gesture, however, he decides that, what the hell, it’s not like it’s so hard to send his wife a short and ostensibly sweet little text. Except apparently it is, because the text ends up going to Jim down at the quarry, who views those 12 words from Mike as the nicest thing anyone’s ever said to him. As a result, not only is Mike put in the supremely awkward position—for him, anyway—of having Jim open up to him (“You ever see an 180-pound 12-year-old with a comb-over? It feels good just to say it!”), but Jim’s inability to keep his trap shut gradually results in the whole office turning green with jealousy and wondering why they aren’t very special to Mike. Funnily enough, though, when Mike finally gets so frustrated with his personal space being invaded that he can’t help but admit his error in texting, his employees’ shock comes not from the mistake he’s made but from the fact that he’d think that it was a romantic gesture to send his wife a text that says, “I know I never say it, but you’re very special to me.” After a few more disconcerting moments of boss-employee bonding, including Chuck’s too-sensual-by-half advice on how he might want to woo his lady, Mike dismisses them abruptly. He does end up taking at least a little bit of a hint, bringing Frankie a bouquet of flowers, but he falters when he attempts to actually express what he’d tried to text her earlier. It’s okay, though: she knows what he means. Okay, time for Axl and Sue’s stories, which dovetail into each other in such a sweet fashion that, sure, I admit it, I got a little misty. It looked like Sue might’ve been in for a lemons-into-lemonade sort of Valentine’s Day, what with her big plan to volunteer for post-dance clean-up duty, rationalizing, “I may not be in love, but I can still clean up for people in love!” Soon, however, she doesn’t need to fall back on her trademark optimism, thanks to her ex-boyfriend Matt having seen the light, kicked his girlfriend to the curb, and offered to take Sue to the dance. To say that this raises her spirits would be an understatement (“I’m not gonna be a loser after all! I’m so relieved I can barely breathe!”), but as with so many things in Sue’s life, heartbreak is still only a phone call away. Axl, meanwhile, is presumably at least a little bit bummed that his girlfriend is going to be out of town on Valentine’s Day because she’s attending a wedding (which is a convenient way to excuse the absent Galadriel Stineman and a perfectly reasonable excuse, since lord knows tons of now-divorced couples have forever ruined a holiday for themselves by having gotten married on Feb. 14), but mostly he—along with Sean and Darrin—are just bummed that Boss Co. hasn’t proven to be a more lucrative business venture. After overhearing the end of a relationship in the hallway, however, Axl has a sudden brainstorm: Why not enter the untapped market of break-up outsourcing? Sure, the scenes of Axl, Sean, and Darrin performing the heinous emotional scarring that their classmates aren’t willing to do themselves are hilarious, but it isn’t long before other people’s heartbreaks start to take their toll on Sean and Darrin. And that’s when Matt calls and breaks Sue’s heart via answering-machine message. And yet, truth be told, even with the hilarity of the Boss Co. stuff, Mike’s profound discomfort at work, and the emotional ups and downs of Sue’s romantic storyline, I was still toying with giving this episode an A- all the way down to the last scene. Why? Because even if you can accept Frankie’s decision to throw away Brick’s Valentine’s Day card—the one he’d just given her—before Valentine’s Day had even arrived yet, how staggeringly oblivious do you have to be to leave it on top of the freaking trashcan where the kid can walk by and see it? 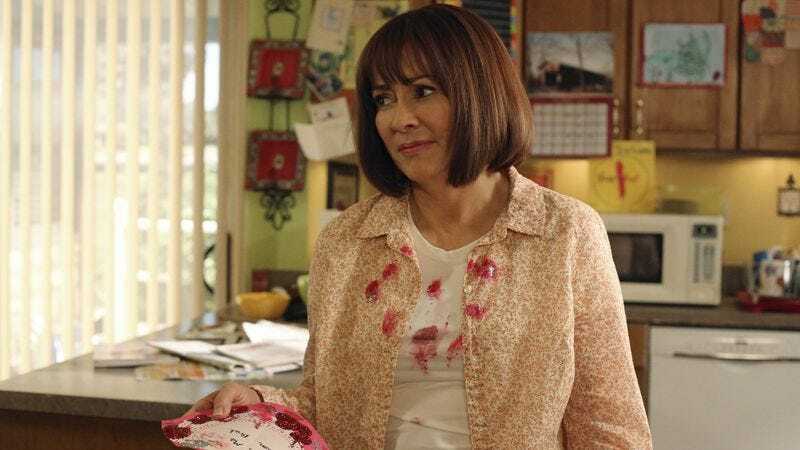 But then came that final scene with Frankie’s Valentine’s Day card to Brick, featuring a heartfelt apology for being the person that she is, followed by a declaration of a mother’s love that, if you found it the day after your mom died, would send you into a grief coma. Then, just as the voiceover’s wrapping up and you’re dabbing a tear from your eye, the sentimentality is defused so abruptly, yet in such perfectly just fashion, that—not unlike Dave Foley’s “kids in the hall” joke a few weeks ago—it shocks a laugh out of you. “How can we be so powerful and powerless at the same time?” Deep stuff, Darrin. Real deep stuff. All of the Boss Co. stuff was great, but I really liked the standard release form suddenly changing from a seven-day waiting period to three days. And “We’ve got a runner!” And “I’m sorry, but you plus Kyle no longer equals forever.” So much great stuff. Nice callback from Dave to explain why there’s no longer a gaping hole in the kids’ wall. I couldn’t quite read it. Did the board at Mike’s office really say “2½ days w/o an injury”? If only we could all make good on our dreams to build a successful company, sell it to the Chinese, buy some recording time, cut a hit album, rock the planet, and start a men’s fragrance line. “The opposite of fission is fusion. Everybody knows that.” Check out the big brain on Shaun!